This is a great solution when you want to fit disc brakes to that old school frame with no disc mounts. Fits 90% of old alloy frames with conventional pressed plate rear dropouts. Fits virtually any frame with vertical dropouts and flat plate chainstay ends. Hole fitted and supplied with bolt for bolting to dropout. (hole needs to be drilled and tapped). Fine adjustment screws to anchor it if bolt not used. 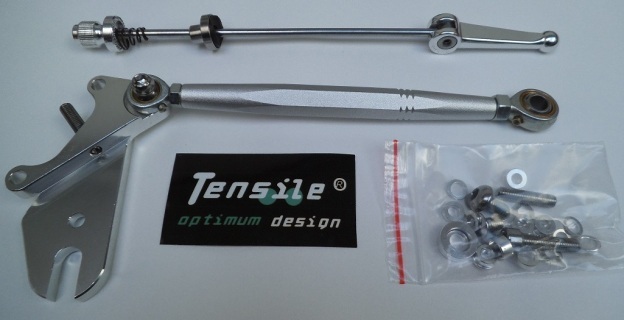 Supplied with extra long quick release skewer because rear dropout is expanded on the outside. Torsion bar counteracts back forces when brake is applied. This is a great solution when you want to fit disc brakes to that old school frame with no disc mounts. Fits 90% of old alloy frames with conventional pressed plate rear dropouts. May be a problem if the dropouts are not flat around the dropout where the wheel axle fits. ie. CNC side webs etc.